It’s as easy as P.I.E. (pencil, ink, erase) writes Mayne, teacher and artist. Mayne began to pursue his drawing passion at age ten by tracing his favorite cartoons. This included the works of Peanuts cartoonist Charles M. Schulz. For cartoonists of all ages Mayne’s creatively designed book is complete. He takes an age-old profession and divides it into an organized and easy to follow cartoon instruction manual. Each chapter displays some of Mayne’s cartoons with catchy introductions that pique the reader’s interest. The first chapters contain the essence of cartooning, such as what types of writing instruments and paper are best. It also illustrates how to draw simple cartoon faces and body parts by using basic shapes like circles and triangles. Mayne innovatively displays more cartooning information without adding too much text. 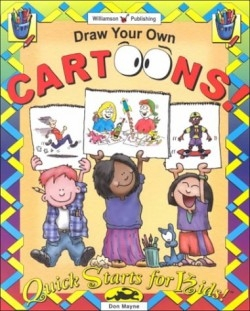 This is called Quick Starts Cartooning Secrets, which provides the reader with inside information on more cartooning techniques. It also reveals some of the problems that inexperienced cartoonist may have. In chapters, Dressing Your Characters and Creating a Cast of Characters, basic shapes are modified into clothing and props, for example, a half circle becomes a baseball cap. Mayne also shows how to bring a character to life. He takes the shape of a hot dog and bends it into an arm or leg. Then illustrates how to pencil in details like pockets or binoculars. The emphasis is on the importance of practicing the cartooning mechanics. These chapters include helpful insights entitled Through the Cartoonist Eyes. These tips can help the new cartoonist see and think like a professional, for example, by asking what kind of personality or facial expression does the cartoon have. Other chapters discuss how to cartoonify objects and animals. Mayne describes this process in simple detail. First draw a normal object, such as a hamburger. Then remove unnecessary details like lettuce or tomatoes. Finally, exaggerate the essentials; perhaps make the bun bigger or the meat thicker. Another chapter provides special effects and tricks of the trade. Examples are extreme facial expressions or Mayne’s favorite, showing action or movement by using clouds of dust or sound words like thump! The last chapter explains drawing a cartoon scene and summarizes what has been previously presented. This chapter also includes Ten Easy Steps to Great Cartoons, Your Signature, and Showing Off Your Stuff. Mayne not only assembled a complete cartoon instruction package, but he makes it fun and easy to learn cartooning. He gives the reader plenty of tips and places where they can practice or experiment with their own creativity.